What are the benefits of AGM membership? Completely revised with over 200-pages of a comprehensive, step-by-step guide to making your retail operation successful. Unlimited postings of job opportunities on the website. 140 Vendor Partners are members and they are the most recognizable suppliers to the industry. Many of those companies provide AGM members with special “Buying Incentives.” Taking advantage of just a few of the incentives will more than repay your membership investment. The AGM awards scholarships annually to qualified merchandising students who plan to pursue a career in golf merchandising. Invitations to attend AGM Educational seminars at member rates including the annual AGM Orlando Retail Conference held on Wednesday just prior to the beginning of the PGA Merchandise Show. View our Events Calendar for an up-to-date listing. Subscription to the monthly e-newsletter, the AGM e-Tailer, which includes retail-related articles, member news and merchandising ideas. Comprehensive manual on fabrics and fabrications. Three editions with hundreds of ideas and events to increase profitability. Through an annual survey of merchandiser members, the AGM provides statistics on compensation, golf shop sales statistics and buying habits. Quarterly Retail Sales Outlook from the National Retail Federation. PGA/LPGA members who attend AGM-sponsored events receive continuing education credits. AGM Member "bulletin board"- our on-line forum for discussion annually sponsored by the Greg Norman Collection. Complimentary hotel night at the Americas Mart - Atlanta Gift Show in January and in July - a value of over $400. Visual Merchandising and Store Design Workbook. Key Presentations from the annual AGM Orlando Retail Conferences. Presentation of awards and recognition of the winners of the annual AGM Front Nine Awards. 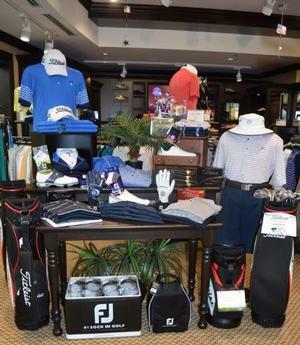 Featuring ideas and suggestions for creating visually appealing merchandise displays in your golf shop - sponsored by Fairway & Greene. Reviews of major golf merchandise shows, retail industry apparel shows and gift markets with company details and contact information. Online learning seminars presented by the AGM Education Team on a variety of topics. Annual Merchandising Calendar with visual displays and promotional ideas. Complimentary subscription to PGA Magazine. Golf professionals, assistants, buyers/merchandisers, specialty golf shop owners, club managers/club owners who are directly involved in the buying/selling of merchandise at a golf retail operation. Annual dues are $225. Individuals who work at the same golf retail operation as an AGM Merchandiser member. Annual dues are $100. Merchandising students enrolled in an accredited college or university. Annual dues are $100. Vendor partners/suppliers to the golf industry. Annual dues are $450 with a one-time initiation fee of $1000. To join, complete our online membership application.